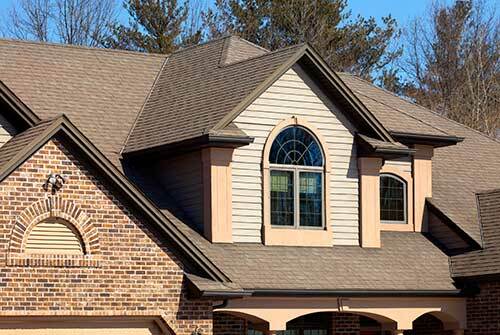 For a variety of roofing services, look to North East Home Improvement. With unmatched customer service, years of experience and professionalism, we provide the best option for any and all roofing needs. Our team is equipped to handle new roof installation, repair and maintenance, and upgrades for both residential and commercial properties. We will be able to help you decide on the best option for a new roof from the many different installation techniques and materials on the market. We also provide inspection services as well as surveys. Your satisfaction is our number one priority so let us work with you to tackle any challenge your roof presents! North East Home Improvement, the premier choice for all matters roofing, is available today. Call now for a free estimate and to learn more about how we can help you! We repair and install all types of asphalt shingles. If you’re worried about how a new shingle color/style looks on your house we have a program that lets us show how your roof would look in any shingle right on our tablet. If your shingles are covered with mold or stains then the roof shampoo is the perfect solution to cleaning up your shingles. After soaking the roof and spraying our cleaning solution we give it a deep scrub then a light powerwash. It’s important to only lightly powerwash the roof because anything stronger will deteriorate the shingle, this can be a costly mistake and is why it’s important to have the right people power washing your roof. Don't let the next heavy snowfall damage your roof. We remove dangerous snow accumulation on your roof to prevent ice dams and other potential hazards. Let us help protect your roof investment. Call us today. Emergency roof snow removal service is also available! Stop mold before it even starts by installing zinc strips at the top of your roof. When the rain washes over the zinc the two activate to create a mold killing machine that kills and prevents any mold on the roof.